There are currently over 100 singers signed up for the 2014 Scratch Concert and now it's time to generate an audience to hear them! This shouldn't be difficult if last year's concert is anything to go by - it was totally sold out. Mozart, Vivaldi and a few songs borrowed from the last night of the proms will be in this year's programme. 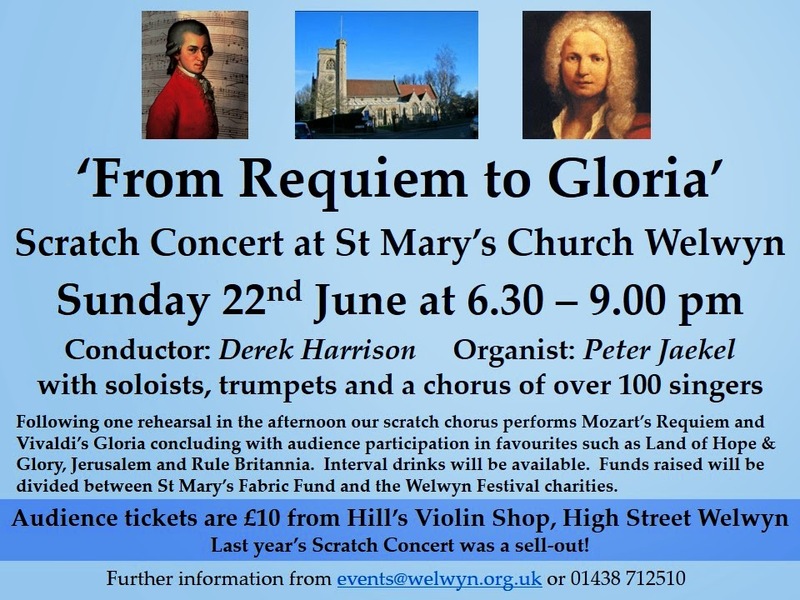 Tickets cost £10 and are available from Hill's Violin Shop in the High Street. Proceeds will be shared between the St Mary's Fabric Fund and this year's Welwyn Festival Charities: Herts Air Ambulance, Isobel Hospice, the Friendship Club, Home Start, Oaklands and St John's Schools, Friends of the Mimram, Herts Action for the Disabled, SERV (bloodrunners), 1st Welwyn Scouts, Gombards home for the disabled, QVM/Danesbury Hospital, McMillan Cancer, Canine Partners for Stroke Victims, Medical Detection Dogs plus a donation towards repairs to St Mary's Church walls via Welwyn Parish Council. Further information is available by contacting 01438 712510 / events@welwyn.org.uk.